Not since construction of State Hospital No. 4 at the start of the Twentieth Century has Farmington witnessed such a building boom that is now getting underway in our town. Of course, most people in this area are well aware of the large new Schnucks store that opened in the Maple Valley shopping center in mid-November. However, this report will spotlight work that is just beginning on new projects in addition to other buildings that are now under construction in the Farmington area. 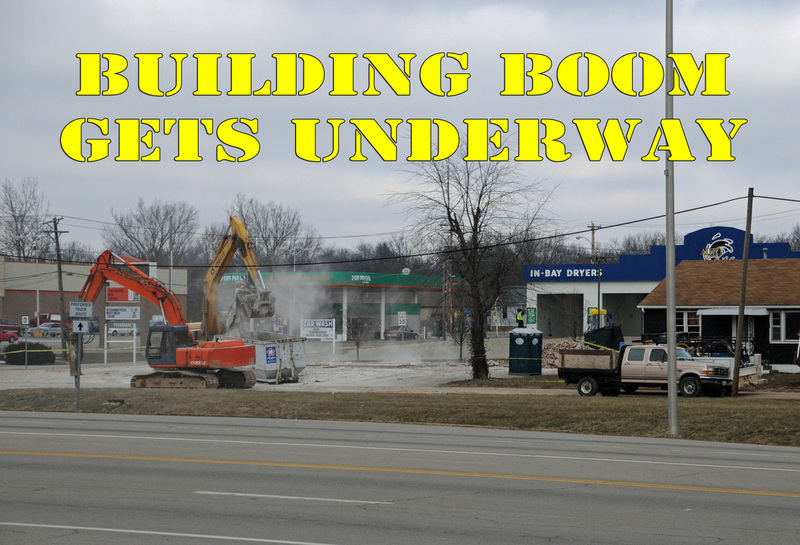 This includes the Early Development Center adjoining Truman Auditorium, the five classroom expansion at Roosevelt elementary, the new CVS Pharmacy, a new, larger facility for Signs, Inc., and the total rebuilding of the old Hacienda Restaurant in the downtown area. Just down Columbia Street , First State Bank will soon begin adding a third floor to most of its current building -- which will make it the tallest office building in town. Also under construction is the city's $5.8 million Public Library. Work is slated to start soon on a huge new Menard's store, and the new 12,000-square foot primary care facility associated with Saint Francis Medical Center at Cape Girardeau on a 9.3 acre parcel of land on the west side of the 500 block of Maple Valley Drive and Hazel Lane. Also under construction is the $5.8 million Public Library and the third of five planned large apartment buildings next to Parkland Hospital. Ground will also be broken soon for a large new farm supply business and several other stores on the west side of Highway 67 just off of Maple Street. The primary firm in this new project, Rural King, plans to build an 85,000-square foot retail store starting sometime this Spring. Finally, in just over a year from now work will begin on an impressive new gym on the High School campus just across from the Centene Center. Over the next few days photos highlighting each of these projects will be added below. Work on the new High School Gym is scheduled to begin in about a year. The current gym, which is just north of the location of the new one, was built around 1958 and has long been considered too small for the current school population which has doubled in size since the old gym was constructed. In addition, the new gym will contain an elevated walking/jogging path above the seating area. Meanwhile, the old gym will continue to be used to accommodate the numerous sporting events taking place at the high school. Not included in this report are several other new businesses which are just opening or will be opening soon in existing buildings in Farmington. These projects will be featured soon in a separate report.